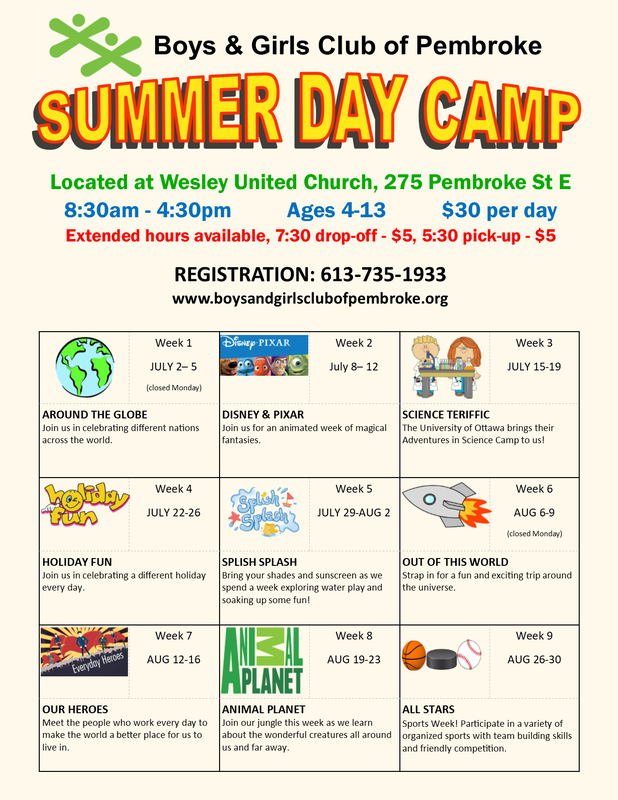 Summer Day camp is a great way for children to spend the day while you are at work. This camp allows you to drop your child off and have the security of knowing that they will be safe and will have a fun filled day/week of activities, crafts and sports. You may wish to sign up for the week or just pick a few days. Watch for a list of activities the beginning of April. Once the registration form is received in the office, an invoice with payment due dates will be sent to you by email. Payments can be made by cash/chq in the office, or can be sent by etransfer to payments.bgcpembroke@gmail.com. Income Tax Receipt will be issued at the end of the year. If you are paying by cash you will also receive a cash receipt at the time of payment. Forms can be filled out and faxed to 1-613-706-0130, emailed to administrativesupervisor@boysandgirlsclubofpembroke.org, or a paper copy can be filled out in our office. Your child will require a camp T-Shirt every day this year, as we will be wearing them on our outings and field trips. One T-Shirt is included with your membership fees. If you require additional shirts they can be purchased for $10 each. Please indicate the size and number of shirts required on the registration form. If you are unsure of the size we have samples at the office to try on.